Halloween is such a magical time for all Witches – regardless of their spiritual path. It’s this time of the year when the Veil faints and we are able to cross the worlds and receive valuable wisdom and magical powers. Halloween is associated with the Real of the Dead. You can read here more about Halloween and what is all about. But there is one thing you already know for sure. 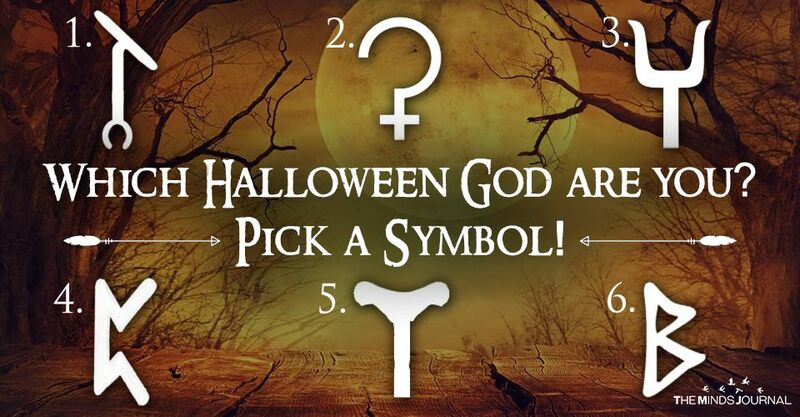 As there is more than one God for Death, there could not be on Halloween God either. (See here some Gods associated with Halloween – Samhain). Which Halloween God – Goddess are you? We are all going to face Death. And Death is only the beginning for something new. The night comes only to give birth to the Sun again. This is the circle of life. But each one of us has a unique and personalized attitude towards death. This is not permanent and it can change. Do this test next year. You will see what we mean! Which symbol of ‘Death’ attracts you the most? Pick one! Each symbol corresponds to one deity who is somehow associated with Death, the Rebirth and the Realm of the Dead. So let’s take a look. You picked the Sceptre of Anubis. The was sceptre is a symbol that appeared often in relics, art, and hieroglyphics associated with dominion and unquestionable power. Anubis is the great Gatekeeper of the Realm of the Dead, therefore a true Halloween God. He is good and fair. He is the one in change defining whether a soul is pure or not but also the one who can unblock all problems. Read more about Anubis in a detailed article – here! If you picked Anubis, then you respect the power of Death yet you actually believe it’s a doorway to another life. You try to be fair in this life and you know about karma. Use the power of Anubis to unblock your path in this life. You picked the symbol of harvest, the symbol of the Great Goddess of Earth, Demeter – Ceres. She is also the Goddess of fertility but she is associated with Death as well. The Harvest is just an inevitable part of what we call life. Read more about here Demeter and her daughter, Persephone here! If you picked Demeter, then you are a bit nostalgic about your younger years although as time progresses you make peace with what’s coming. The harvest is a bit scary for you and you are not convinced about the afterlife but you do make peace with it as it is part of the creation. Keep on smiling though, death is only another beginning and life… oh, life is full of mysteries! You’ve picked the Bident, a two-pronged implement (similar to the Trident – the weapon of Poseidon), which is the weapon of Hades, God, and Ruler of the Underworld. He is a wise and frankly – quite rich – ruler of the Realm of the Dead. Hades is not just another Halloween God. He is too powerful. Zeus, Poseidon, and Hades picked the three kingdoms of this World. Hades picked the Kingdom of Death. If we are talking about an Emperor of this Realm, Hades is the one! A handsome and powerful ruler. (Read more about Hades and Necromancy, and explore his palace here).